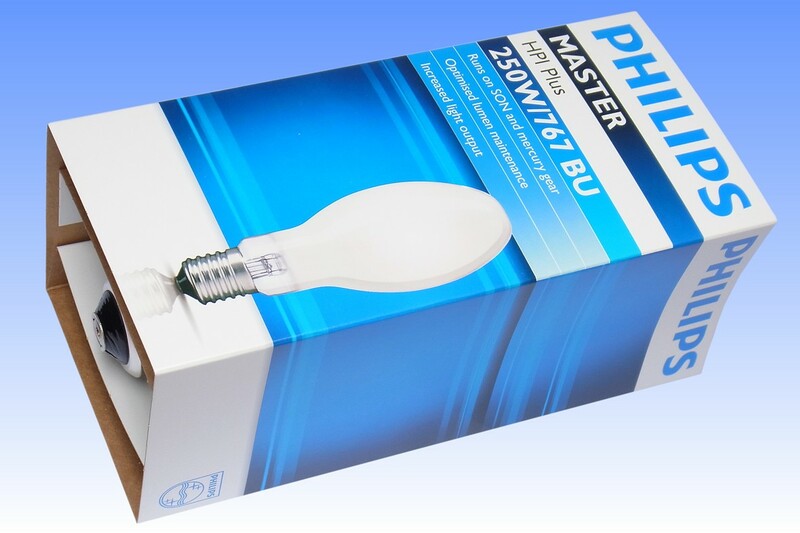 The Philips HPI lamps have traditionally been characterised by their neutral white colour light, having a colour temperature of around 4000-4500K and mediocre colour rendering index of about 60-65. That is typical of the tri-band sodium-indium-thallium arc tube chemistry that is preferred by Philips. 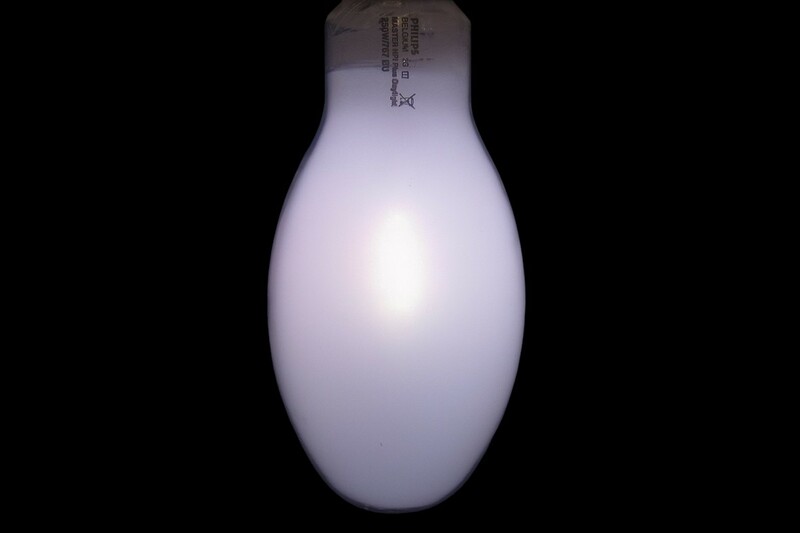 Meanwhile competitor lamps using rare-earth dysprosium chemistry achieve a daylight colour light of about 6000K with an exceptionally high colour rendering index of about 90. Neither is suitable for all applications, but Philips recognised an opportunity to expand its market by offering both colours. 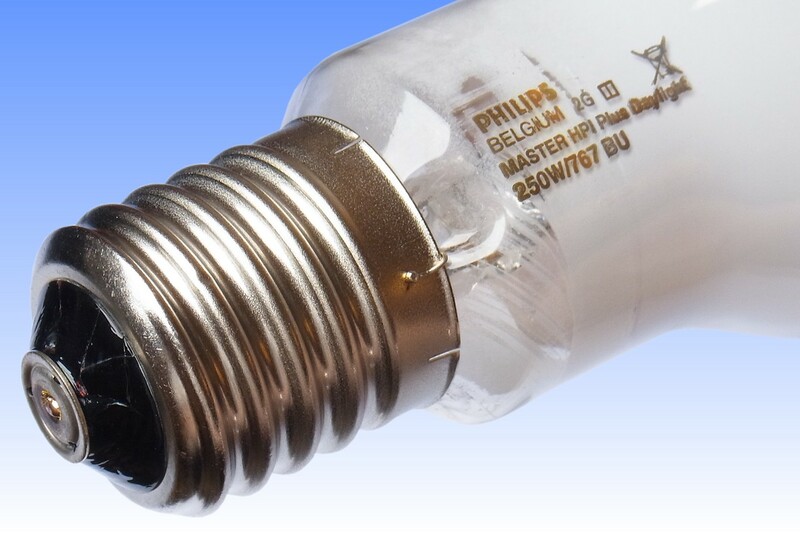 To avoid the need for developing an entirely different lamp based on rare earth chemistry, a novel compromise was achieved via this most unusual fluorescent lamp. The arc tube is similar to that in the company's standard HPI lamps, but spectral analysis suggests reduced sodium and thallium concentrations. 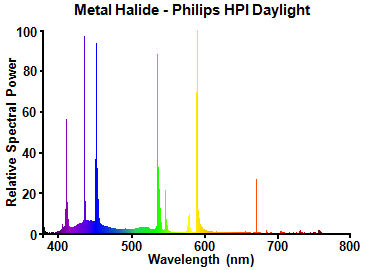 The fluorescent coating on the outer bulb has been changed from the usual red-enhancing yttrium vanadate to a powerful blue-green phosphor - note the broad band emission in the spectrum. The result is a daylight colour light of 6700K, although still with a poor colour rendering index of about 70 (which was later revised downwards to 60+, perhaps following difficulties of consistently attaining the higher value in production). 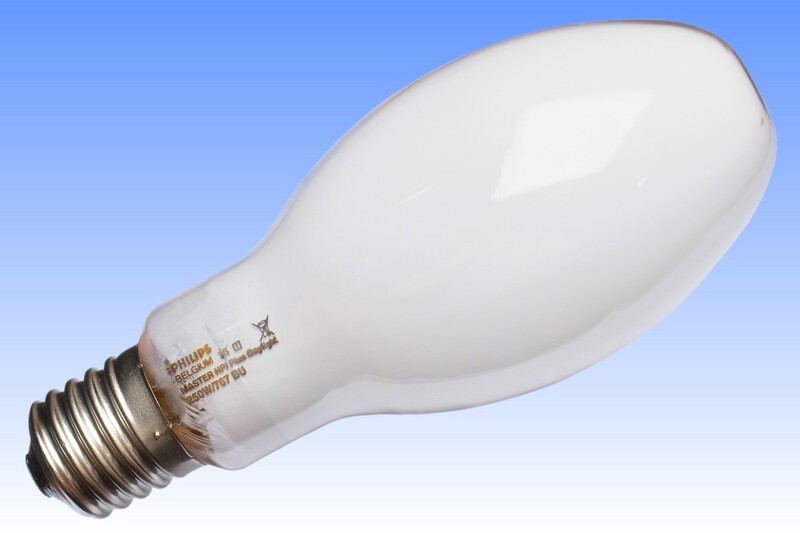 The light absorption of the phosphor coating is entirely compensated for by its emission, luminous flux being the same as the neutral white lamp. This lamp is one of very few HID examples where a phosphor is employed to increase the colour temperature - normally the opposite is true, with phosphors being applied to improve colour rendering by radiating red light. References: 1) Philips Catalogue 2012, Holland. 2) Philips Brochure, HPI Plus Lamps, 2016.